It’s not easy to make an appointment with Emilio Spada; his time is governed by nature, not a watch. In the clear air of Sassocorvare in the heart of the Marche and Montefeltro, an enormous, fluffy cloud arises. It is a flock of 1,700 sheep from which Emilio and his son Nicolò emerge, followed by three splendid sheepdogs. Emilio is only 32 years old, but in his eyes and heart he holds the wisdom of his Sardinian ancestors. The story of the farm called Cau e Spada begins in Sardinia. It is a personal story that intertwines with the history of Italy as a nation. It begins in the early 1970s, when the young Antonio Cau worked as a shepherd for several of his fellow countrymen who had transferred to the Marche. 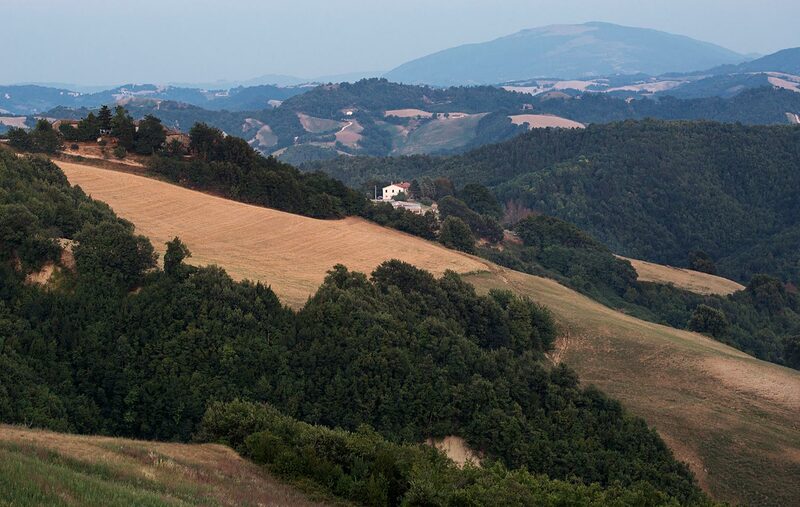 They had moved there in search of new land to cultivate, claiming the very same countryside that had been abandoned by the people of the Marche in search of a job in the city. The young Antonio Cau had an independent and rebellious spirit. He took orders from no one; and he wanted a piece of land all his own. He wrote to his father in Sardinia to ask for help. His father interceded by way of his friend Emilio Spada, who sent his own son, Antonino, to the Marche with all of his worldy belongings: 218 sheep, headed directly for Antonio Cau. All great adventures begin with friendship. In this case, it even went beyond friendship to family when Sara Cau, Antonio’s sister, married Antonino Spada. The two brothers-in-law worked long, hard hours, and the flock grew. 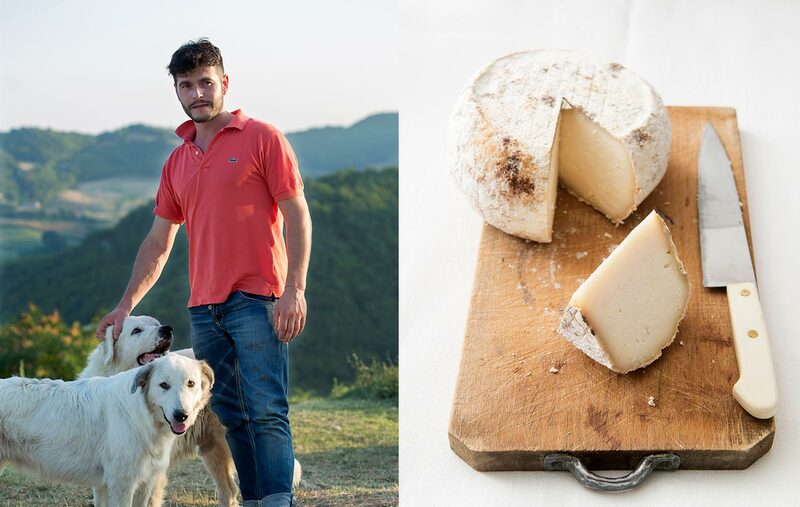 The high quality sheep’s milk was transformed into the most classic and natural of sheep’s cheese: the Sardinian kind. Emilio Spada was born in 1983. He was named after his grandfather, as is custom in Sardinia. Emilio also inherited his grandfather’s independent nature, love for animals, and respect for the earth. Emilio always preferred the Appennines pastures over school, where he followed his father every day, learning the secrets of an ancient vocation that already felt as though it was his own. It was to be his destiny. Emilio left school at the age of 17; he hungered for knowledge that couldn’t be found in books. He became an autodidact of the properties of milk and learned how to produce cheese. His teachers were the other creameries in the area. Emilio’s experiments often angered his father Antonino, who didn’t understand why he had to waste all his milk on new recipes when the old, tried and true recipes worked just fine. However, it is because of Emilio’s tenacity that today, this small, family-run business – entirely organic and non-mechanized – can use their milk to create unique, original, and unrepeatable cheeses. As he’s speaking, Emilio slices the San Giorgio cheese, which has a white, friable while buttery flesh. It is a miracle of sweetness and acidity. The milk itself inspired him to create this recipe. He only uses milk produced from March to July when the sheep are out to pasture, eating an infinite variety of fresh herbs. The resulting milk is aromatic and low in fat. It is worked strictly under cold temperatures, aged for at least two months, and salted by hand as per tradition.